Thousands of shipyard jobs in Scotland might be lost after it has emerged that work due to begin on building two aircraft carriers may be delayed because of the current economic climate. Work was set to begin in the spring of 2009 for the two 65,000 tonne aircraft after the contract was signed in July this year. The warships, HMS Queen Elizabeth and HMS Prince of Wales, would be the biggest ever built in the UK and work is being shared between four shipyards at Govan and Rosyth in Scotland and Portsmouth and Barrow-in-Furness in England. 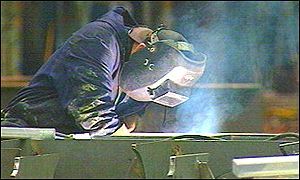 The contract also effectively saved Rosyth Dockyard from closure and would create an estimated 1,600 jobs for the area. When the contract was announced in March, the current First Sea Lord of the Royal Navy, Admiral Sir Jonathon Band announced that he would resign in front of a Commons committee if it did not go ahead. Ian Davidson, the Labour MP whose Glasgow South West constituency includes the Govan yard, cautioned against panic. “Even if there is a delay with the aircraft carriers, it’s not necessarily a bad thing so long as the yards are kept occupied,” he said. Posted in Economy and Business, Uncategorized and tagged Ministry of Defence, Rosyth Dockyard, Royal Navy. Bookmark the permalink. Living Streets Launch This Morning In Holyrood.